The word 'hepatitis' literally means inflammation of the liver. Hepatitis C, which is also called HCV or hepatitis C virus, is a viral disease in the blood that affects liver cells. The virus is one of the most common causes of liver inflammation in the world and can ultimately lead to (serious) liver damage, failure and cancer. At the present time, vaccination against hepatitis C is not possible, but the virus can be treated with other medication. After a number of years, hepatitis C can lead to liver damage and result in liver disorders, such as fibrosis (the first phase of scarring of the liver) and liver cirrhosis (the infection of increasingly more healthy liver cells due to the spread of scar tissue). What precisely happens if you have hepatitis C virus is described below. The period in which a person first becomes infected with HCV is called the 'acute phase' or 'acute hepatitis C'. In some cases, the body can rid itself of the virus without treatment being required. This happens in approximately 15 to 25 per cent of cases. 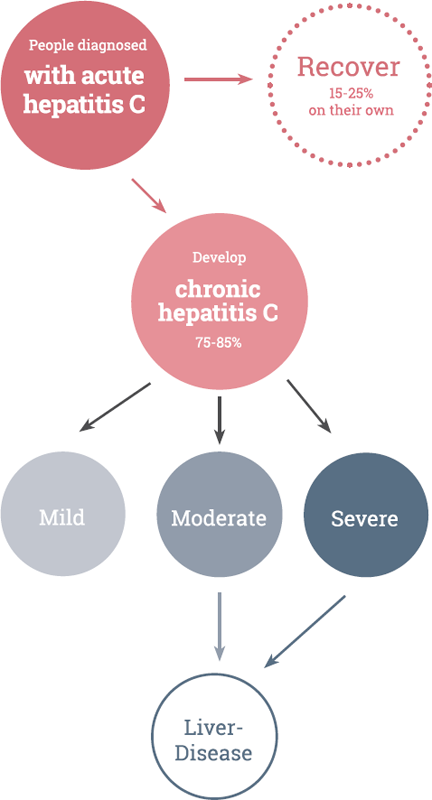 15.000 60,000 people have chronic hepatitis C.
HCV can lead to liver diseases such as fibrosis. Fibrosis is scarring of the liver. The replacement of increasingly more healthy liver liver cells by fibrosis (scar tissue) ultimately results in liver cirrhosis. 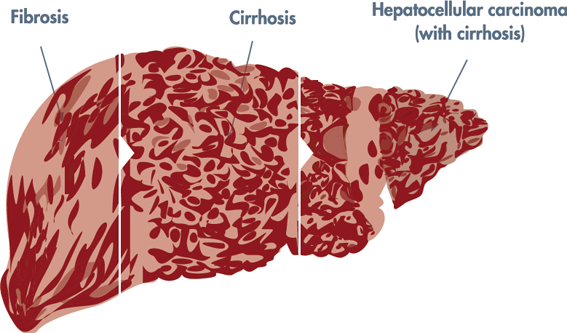 Cirrhosis is severe liver damage: impairment of the liver through the forming of scar tissue. One of the symptoms of hepatitis C that can indicate cirrhosis is jaundice. It takes on average 20 to 30 years for cirrhosis to occur. It happens in approximately 10 to 20 per cent of cases. Some patients may eventually need a liver transplant. In 1 to 4 per cent of cases of liver cirrhosis, the patients develop HCC (Hepatocellular carcinoma). This is the most common form of liver cancer in the Netherlands. Approximately 160 million people (3 per cent of the world's total population) are infected with hepatitis C and most sufferers do not even realise that they have the disease. These are about 160 million people. Every year, about 350,000 people around the world die as a result of chronic hepatitis C. In the Netherlands, 15,000 to 60,000 people (about 0.1 to 0.4 per cent of the population) are affected. The virus is more prevalent in the Mediterranean Region, Eastern Europe, Africa and Asia.